The Heatherwood School caters for secondary aged students with mild intellectual disabilities and is located in the suburb of Donvale in Melbourne’s East. The design for this project explores the relationship between the process of learning and the impact of our surrounding environment on the learning process. The design aims to provide an ordered space with minimal visual distractions to make circulation through the buildings as easy and simple as possible. The school’s motto “Leaning for Life” inspired the design for the project. The notion of the consolidation of learning and stability provided by a solid framework is represented in the repetition of key elements throughout the design. The project is comprised of two elements; a “multipurpose” pavilion and a “learning” pavilion. The repetition of external elements across the design emphasises the concept of learning via repetition. This method of teaching is perhaps the most intuitive principle of learning, traceable to ancient Egyptian and Chinese education, with records dating back to approximately 4,400 and 3,000 B.C (Aspinwall, 1912, pp. 1, 3). In relation to this project, the repetitive elements include the placement of openings, window mullions and the joints between walls and are designed to give a sense of calm and order to buildings. The new buildings are sited in the location of the existing Block D and replace a series of existing “relocatables” that previously housed classrooms, multipurpose rooms and staff quarters. The location of the new buildings also creates an anchor point to the Southern end of the site and provides an efficient use of existing services and maintains the existing play areas. There is a sense of “Big brother, Little brother” expressed in the scale of the new pavilions. This expression is reflected in the scale and celling heights of the two pavilions; the “Big brother” gym / multi-purpose building is contrasted by the “little brother” learning spaces with a more inward program. 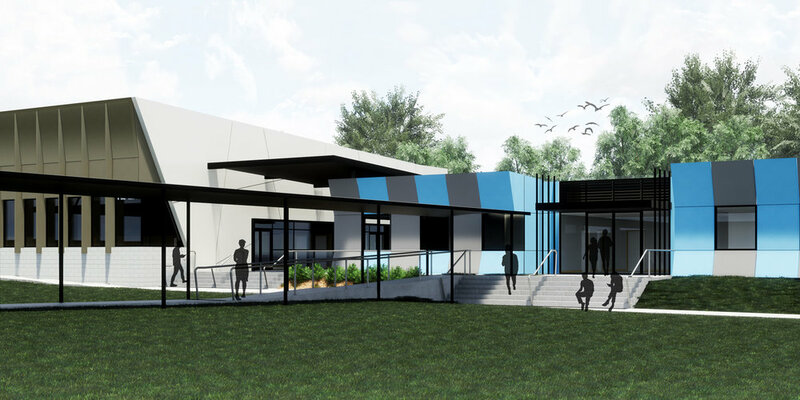 The ‘Big brother” pavilion contains a gym/multipurpose room, music practice rooms and toilet facilities The “Little brother” learning pavilion is designed for maximum flexibility with operable walls between classrooms and art rooms located off a covered area. The notion of repetition also relates to the constructability of the project and can be seen in the regular grid in plan. The project is also designed for flexibility both in its day-to-day operation as a finished product but in the construction phase as a means of cost control and efficiency and enabling the possibility of modular construction. This allows maximum flexibility for the construction process as the buildings can be assembled in modules constructed off site or a traditional onsite build can be adopted. Each methodology has its own pros and cons, however k20 Architecture believe the flexibly to cater for both will ultimately benefit the client in regards to timing and cost of the project. The selection of materials for the project was based on k20 Architecture’s aim to maximise the use of materials sourced locally and with longevity. The design incorporates Environmentally Sustainable Design principles in building design and construction to lower overall life cycle and operating costs for the facility, particularly in terms of water and energy usage costs. Materials and finishes have been selected to have for low/ zero VOC’s, durability, minimised maintenance, local content, sustainable/recycled content, end of life recyclability. The design for the Heatherwood School provides an inspirational new learning environment, for pupils, staff and the wider community. Throughout the life of the project k20 Architecture have sought to enhance the amenity of the school campus whilst providing a calm and ordered environment for students to live and learn.